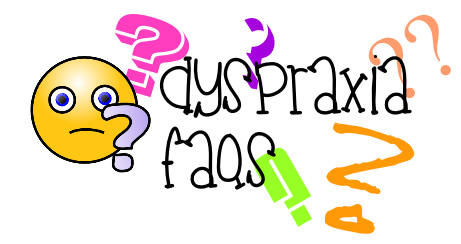 Hopefully this page will answer all your frequently asked questions about dyspraxia, but please drop me a comment below if there’s anything I’ve missed. You’ll also find more detailed answers to many of your questions in our About Dyspraxia section of the site. Are DCD and dyspraxia the same? dyslexia/SPD/ASD/ADD/ADHD dyscalculia/dysgraphia. Is this possible? Is dyspraxia on the Autistic Spectrum? Are there different levels of dyspraxia? Is there a cure or treatment for dyspraxia? I’ve read that dyspraxia means my child is right-brained. Is that true? Why does my child struggle with social skills? How does the mind of a dyspraxic work? Why does my dyspraxic kid fidget so much? Who can give a dyspraxia diagnosis? What happens at a dyspraxia assessment? How can I get my child more help at school? Should my child have a statement/EHCP? Is there anything I can give to my child’s teacher so they might understand dyspraxia? Is my child entitled to DLA? Can you recommend any books on dyspraxia to help my child? Are there any celebrities with dyspraxia? What ways can I help my child with dyspraxia? Dyspraxia is a hidden disability or disorder that occurs when messages from the brain travel to the nervous system in a wiggly way. This results in uncoordinated movements and also makes things such as task sequencing and ordering difficult. So dyspraxia has both mental and physical symptoms: Because of the unordered way in which the brain communicates, subjects such as maths and English comprehension are particularly difficult; But, handwriting, taking part in PE and getting changed for PE are difficult too. You can read more in our article What is Dyspraxia? In general, your child is probably clumsy and ends up with bruises they can’t remember anything about. They may find it difficult to dress themselves, have messy handwriting, and likely find it difficult keeping up with their friends in PE lessons and the playground. They may also have a good long-term memory, but their short-term and working memory isn’t as good. Maths is probably their least favourite subject at school. But that is all very general. Click here, for a more comprehensive list of the good and less good symptoms of dyspraxia. The simple response is YES they are. The NHS now prefer healthcare professionals to use the term DCD (Developmental Coordination Disorder) but many still use the term dyspraxia–hence the confusion. They are used interchangeably or depending on the professional you are dealing with. You can read more about why dyspraxia is also referred to as DCD in our article What’s the Difference Between DCD and Dyspraxia. Dyspraxia is a hidden disability. It is also referred to as a disorder, immaturity of the brain, a motor learning disability, a neurodiverse condition. You can read more about this subject in our article Is Dyspraxia a Disability. There is no known cause for dyspraxia, although many people believe that there is often a genetic link, and some believe that it can be due to a traumatic birth, a premature birth, or a problematic pregnancy (involving alcohol or drugs). But, dyspraxia is definitely caused by a problem with the development of the brain–whatever the original cause of that might be is up for debate. My child has a diagnosis of dyspraxia but I also think he/she might have dyslexia/ SPD/ ASD/ PDA/ ADD/ ADHD/ dyscalculia/dysgraphia… Is this possible? YES! Dyspraxia loves company and will rarely exist alone. In neurodiverse conditions, like those listed above, there is usually some overlap, and in the case of dyspraxia and dyslexia the overlap is 50%. Children with dyspraxia also commonly struggle with handwriting and maths, and if this is at the severe end of the spectrum then it’s likely they also have dysgraphia (inability to write coherently) and dyscalculia (severe difficulty in understanding numbers). Dyspraxic kids find it hard to concentrate on certain tasks, but this is often because they don’t understand or can’t process the information quickly enough. So attention deficit is also a symptom of dyspraxia, but if there are other symptoms (such as hyperactivity) then a diagnosis of ADD/ADHD is also likely. No it isn’t. Although (as discussed above) there is an overlap between neurodiverse conditions so it’s possible to have ASD (Autistic Spectrum Disorder) and dyspraxia. Yes. Dyspraxia is a spectrum condition–which doesn’t mean that it’s on the autistic spectrum–but it does mean that there can be a great deal of difference between one child with dyspraxia and another. Symptoms can most definitely range from mild to severe. For example, my child of 9 has only recently been able to get in the car and put her own seatbelt on, but a younger friend with the condition has been doing this since age 6. Those with mild dyspraxia may be able to adapt more easily to succeed in maths, or to develop neater handwriting at a younger age. Whereas those with severe dyspraxia may still struggle to write neatly as adults. There is no ‘cure’ for dyspraxia as it isn’t an illness. There are many ways that the symptoms of dyspraxia can be treated or helped, and this is usually with the help of occupational therapists, physiotherapists, CAMHS, educational psychologists etc. depending on where your child’s needs are. You may also find that a supplement of omega-3 can help your child’s concentration. You can read more about the benefits of omega-3 here. The main issue with a dyspraxic’s brain is that the left and right side of the brain don’t communicate with each other effectively. But it’s true to say that dyspraxics are usually more right-brain dominant. The right side of the brain deals in visuals and creativity, whereas the left side is the more practical and maths side of the brain. The left side also deals in language, and processes what is heard and said. Thus explaining why our dyspraxic children often understand something but struggle with putting the words together to say it or get it down on paper. The good news is that being right-brain dominant is a big clue in how to help a child with dyspraxia learn: make it visual. It also means that dyspraxics are very creative, imaginative, and artistic. A lack of social skills is one of the symptoms of dyspraxia that isn’t often talked about or referred to in lists of symptoms, but it’s a very real issue. Due to the way a dyspraxic child processes information, they often can’t judge certain situations. Dyspraxia means that children with dyspraxia lack the ability to read non-verbal signs of communication. So they can’t judge if someone is uncomfortable being hugged, or how to speak to a friend if they look sad. Like many symptoms of dyspraxia though, social skills can actually be taught, and mostly their happy outlook and funny approach to life is enough to get them through. In a very random way! The brain functions by passing a signal from one brain cell to another, just like a relay race. In a typical brain, these signals pass over smoothly. In a dyspraxic brain these signals reach the muscles in a wibbly wobbly way. In a child with dyspraxia, imagine the signal is the baton in a relay race that doesn’t go to plan; sometimes the baton gets dropped, gets handed over too late, or gets twisted in the changeover. This doesn’t mean that the signal/baton is completely lost, or that it will necessary happen next time though; just as in sport, training and repetition can help to get the baton over the line. In other words, the dyspraxic brain needs training in order to smooth those neuro pathways the next time the same action is required. You can read more on this fascinating subject in our article here. Although annoying, fidgeting actually helps your dyspraxic child. It helps them remember where their body parts are, which is something the rest of us take for granted. So by twitching their foot, or tapping their fingers, they are sending messages to the brain saying ‘here I am!’. This way, your child can concentrate on what they’re meant to be concentrating on. If they are told to stop fidgeting, then the brain is seeking the feedback but not getting it, hence an inattentive child. Proprioceptive exercises can help with this, as well as the fidgeting. You can read more in our article Why Your DCD Child Fidgets. This seems to vary from region to region as well as from country to country, but usually the diagnosis is made by a pediatrician. Although I know in some areas that the pediatrician will refer the final diagnosis to an occupational therapist. The first step is to visit your family doctor and explain your concerns, the doctor should then refer you to the community pediatrician. From there, the pediatrician will make their diagnosis and get you put on the waiting list to get help from other professionals such as occupational therapists and physiotherapists. Firstly, don’t worry! The assessments are really nothing that should upset you or your child. There are likely to be two different assessments to go through. An assessment with a paeditrician doesn’t involve your child much at all, it’s more just lots and lots of questions for you: When they first started walking; What they find most difficult at school; Can they dress and undress themselves etc. They may also get your child to do a few activities, such as walking along the corridor, running along the corridor, standing on one leg etc. An assessment with an occupational therapist is lengthy (an hour or so) but fun. Mostly, children don’t even realise they are being assessed. There will be lots of physical activities: walking along a line; jumping from one coloured mat to another etc. And there are a lot of fine motor skills activities: draw a picture of mummy; write your name; cut along this line; copy these shapes etc. Firstly, make sure that the school has a copy of the diagnosis letter, if you have one, and that they are on the SEN register. Your first port of call should be your child’s teacher and/or the SENCo (Special Educational Needs Coordinator) or inclusion officer. The SENCo should review your child’s progress regularly and hold meetings with you too. They should think of ways to best help your child. This could be 1-to-1 help with a teaching assistant, a writing slope, use of a laptop etc. You often need to be pleasantly pushy in reminding the SENCo that you’re there or indeed, coming up with your own solutions and asking them to be put into practice in the school environment. All children with a dyspraxia diagnosis should be getting additional help and resources at school, but if everything is being done and there is still little progress, then it’s time to ask for the EHCP process to start. An EHCP (Education and Health Care Plan) is essentially the new name for a statement. An application is made to the LA (Local Authority/council) by either the school or you as parents and you need to submit supporting data. It’s a long and complicated process, but, if successful, your child will be awarded an EHCP specifying what help they should be getting. More money can also be awarded to the school in order to make sure the plan is in place, or the LA will give money directly to a special school if that is what is deemed necessary. Speak to the school SENCo for help on any of this. We have some visual handouts that you might like to give to your child’s teacher. As well as general information on dyspraxia, there are specific issues listed that kids with dyspraxia find difficult at school. There’s also a box at the bottom to give the teacher further information on your child. Simply sign up to our mailing list and you’ll get these handouts for free as part of your welcome email. You can find more about what kind of further information the teacher might find helpful in our Back to School article. Possibly. Disability Living Allowance (DLA) is awarded to children based on how different they are to other children their own age, and not simply based on what diagnosis they have. Having multiple diagnoses will not make a difference to your application, but rather the way in which the condition(s) impact upon your child in their day-to-day life. I know plenty of people who have been awarded it and plenty who haven’t. There is a great guide that Cerebra provide, which I strongly recommend you use when completing the forms. The form is over 40 pages and can be very emotionally harrowing to complete. The Citizens Advice Bureau can also help you to complete these forms if you aren’t confident at doing do. My other recommendation is that you make sure you get the page of the form completed where another person states what difficulties your child has. A SENCo or teacher is ideal–diagnosis letters are great to include too, but a statement coming from a professional who knows your child well definitely seems to help. For kids of primary school age or younger (3-11), the book You’re So Clumsy Charley is hard to beat. It shows the positive side of dyspraxia in story form, but without making it a big deal. Basically, the moral is: it’s great to be different and you just need to find your ‘thing’ that you’re good at. Caged in Chaos is fabulous for older children. Written by a teen with a fabulous sense of humour, it’s highly recommended. Of course! It’s widely thought that Einstein had dyspraxia (although the condition wasn’t known then), and Daniel Radcliffe, Florence Welch, and Cara Delevingne are modern celebrities who have spoken about dyspraxia. The famous photographer David Bailey is also a fantastic dyspraxic. We have a great article on famous dyspraxics with some inspiring quotes too. Firstly, remember that although dyspraxia can be a real pain in the wotsit and be a cause for concern, there are loads of positive things about dyspraxia too. More importantly, please take comfort in the fact that dyspraxics usually get there in the end–they just take a little longer. Patience is a virtue you are going to have to make friends with, embrace, invite in to your home and drink coffee with (or something stronger) on a regular basis. Concentrate on main and basic skills like fine motor skills, practising physiotherapy at home, what order to get dressed in, how to tie shoelaces etc. Work on one thing at a time. So this week, work on buttons, for example, and go from there. Dyspraxics are best concentrating on one skill at a time so they develop the neuro pathways to remember how to do it next time. Lots of repetition! When you practice these skills, things like handwriting become less of a struggle as you are working on the root cause. It will also help your child’s teacher out if they can get dressed for PE without help, and will cause your child less embarrassment too. There are lots of articles we have on improving math skills, and tying shoelaces, so take a look around.